I am a divine spirit being who has been reincarnated in this dimension as a impassioned jewelry designer, art director, graphic artist, illustrator, photographer, animal lover, visionary, and all around creative force. My biggest love right now is creating jewelry using beautiful healing crystals and raising awareness of their transformative powers. For example, clear quartz magnifies everything, so if you are happy wear one, but if you are angry while wearing- it watch out. Aquamarine works to amplify your voice, the fourth chakra. Aquamarine is good to wear for an important speech or for help getting your point across. In new ventures I am currently working to set-up a foundation in Ethiopia to house and to teach disenfranchised women the art of traditional metalsmithing. I am so thrilled to start this project. This creative and sustainable artistic venture will empower the women and loop them back into their communities. The jewelry created, a mix of traditional and modern styles, will be sold internationally. I was born in Addis Ababa, Ethiopia. I was then transplanted to upstate New York. I did a small stint in New Hampshire, but I have lived in Brooklyn for the past 18 years. I am constantly traveling and my next stop is the fifth dimension, but before that I will embark on a historical tour of Ethiopia including the underground churches of Lalibela. I collect heroes. Today it is Diana Vreeland! I just saw the most incredible documentary on her. She was a true visionary and a beautiful alchemist with people, life, and art; she transformed the ordinary to the magnificent. She brought fantasy, adventure, culture, and style to the everyday woman through magazines, first through Harper’s Bazaar then through Vogue. She really created the template for what we see today in terms of fashion magazines. Before Vreeland people were telling women how to make pies and how to be the perfect wife. Then the Costume Institute came to life under her vision. One of my favorite quotes from her is “It’s not about the dress you wear, but it’s about the life you lead in the dress.” I pretty much wear a dress everyday so I try to have an adventure just as often as she says and wear a bright red lip. Right now it is The Success Principles by Jack Canfield because it is filled with stories of those who never gave up no matter what happened to them. Creating our own success story is why we are all here. I love beautiful things, people, spaces, mysticism, travel, digital inventions, and I am a little obsessed with Pinterest right now. It is my digital vision board. A friend of mine won a Vespa from a contest on Pinterest. Oh, and working on my telepathy skills. I hate judgement, ugly things, limitations, bad attitudes, the word hate, and not getting paid on time for creative projects. To create and to share beauty, to have fun, and to be an inspiration! Vixen. She is perhaps not the most well known superhero, but she would be my alter ego. She is able to channel the abilities of various animals like speed, flight, and to these powers to transform into animals when needed. I love the Jimmy at the top of the James Hotel in the summer; I can listen to DJ CATO and mingle with a fun crowd. During the colder months, I like the lounge downstairs at Ginny’s Supper Club at Red Rooster on Friday nights with DJ Moma. It is very relaxed. I have lots of places that I love to go to as long as I can dance, and that really depends on who’s spinning where. I am turned on by confidence, intellect, height, and stunning proportions. If you could access a parallel universe, describe one past life and one future life. Who were you and who will you be? 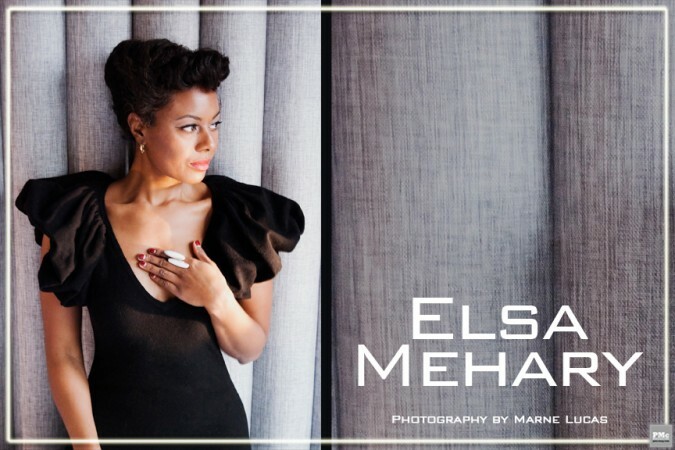 Elsa Mehary is a multi-dimensional artist who works on commercial digital media, print, metalsmithing, and jewelry design platforms. She has worked as as art director for Real Simple, InStyle, Essence, Harper’s Bazaar, and Lucky magazines. She is passionate about empowering women and seeks to help all people discover the power of healing through powerful gems and their ability to raise people’s level of consciousness. She travels for inspiration, excitement, and necessity. Her all time favorite city is Istanbul.